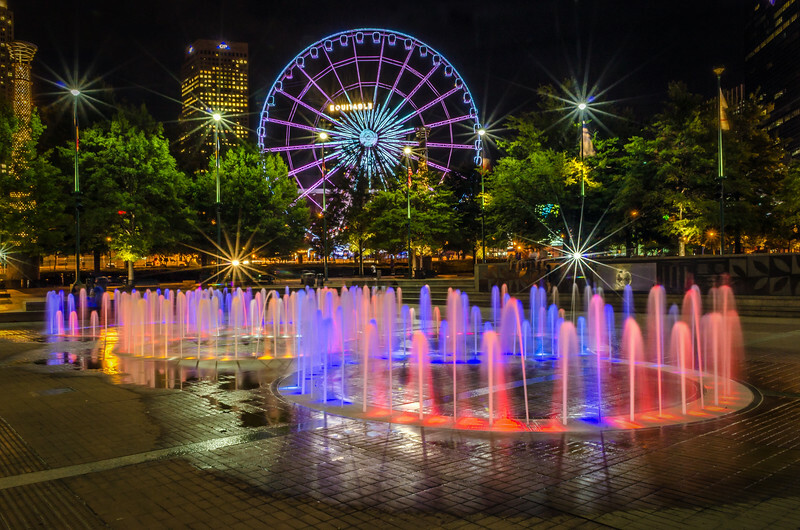 This lucky shot of Centennial Olympic Park was taken on a quiet night just after a thunderstorm. It's rare to get this shot without kids and people congregating around the fountain. This park is a 21 acre public park located in downtown Atlanta. The Fountain of Rings is one of the major highlights of the park. The water and lights interact with built in speakers and music that is played throughout the day, 365 days of the year. The ferris wheel in the back ground is called Skyview Atlanta and happens to be one of the best places to see the city skyline. During the summer Centennial Olympic Park is a major attraction because there are sumnmer concerts, festivals and nearby is the Coca Cola Museum and the Georgia Aquarium.